Though storytelling is a popular live lit activity in Chicago, I haven’t dabbled in it. I’m put off by the requirement that the story must be true. How to tell a story that is true? Which details to include or exclude? I make stuff up. Indeed I think we’re all always making stuff up, and how could we possibly know if we’re telling the truth about our own lives? Our lives intersect with the lives of others, others whose full stories and motivations are unknown to us. The reasons we tell ourselves might not be the real reasons, the actual causes, for how we act in any situation. The reasons of others are something we speculate upon, but are ultimately mysterious. We are meaning-making machines, looking for signs and patterns where there are none. There is tedium in daily life: going to the bathroom; clipping toenails; packing strategically to get through TSA at the airport, doing the laundry, eating dinner. None of these details are particularly interesting to anyone else or even to ourselves, unless we ascribe meaning to them, perhaps by understanding them in some bigger social context or as historical trends, or by attributing emotional significance. We look for a moral to the story, even if there is no moral to be found, or only the one we invent. I have been inordinately preoccupied with myself lately, and more specifically, my family history. I find myself falling down the family history rabbit hole on the internet, and more fruitfully, although much more unpredictably and slowly, through the process of looking through the detritus of death: old papers, correspondence, newspaper clippings, marginalia, etc. 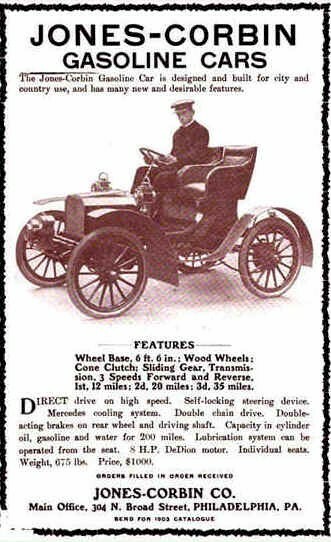 Granduncle George Jones had a hand in inventing an early automobile, I just discovered. Due to a recent death in the family and through a very specific set of circumstances, a peculiar history if you will, several generations of things including furniture, dishes and glassware, books, family photographs, art created and collected by family members, plus handwritten notes, cards, diaries, etc. have accumulated in one house, which I find myself compelled to look through. And I am not complaining about this at all, and I am not seeking sympathy or advice. Looking through these things is something I’m choosing to do. I could turn my back on it and choose not to look at it, leave it for someone else to deal with. But a stranger wouldn’t know that the paintings on the wall are of me and my sister when we were very young, or that the antique, ornately hand carved violin was made by my great grandfather on my mother’s side, a Welsh immigrant named Tom Jones, father of ten children, three of whom died as children. The youngest child was my grandmother Bessie Smith. Tom Jones died in his workshop, left his children his tools. They used them to start their business, Jones Machine Tool Works. Supposedly the brothers were the eccentric dreamer inventors and the older sisters were the financially savvy number-crunchers who knew how to keep the business going. During World War II, the women sewed baby clothes to wrap the machine parts they sent to England, or so the story goes as told by my mother, the only child of the youngest child Bessie. Bessie went to art school and designed hats and had lots of boyfriends before she married my grandfather Charlie Smith, or so the story goes. And there are so many stories, and then there are the ones I don’t even know. And then there’s connecting the family stories to actual historical facts and trends. My mind flits from different stories and time periods and memories. How should I shape this so that it’s something interesting for others to read? I’m fascinated, mesmerized, by the old family photos from the 1800s, but it’s because they are my family that I never knew. I look through letters, cards, receipts, and a story emerges. These are the things the family kept, thought were important. A man I lived with in college described the way I do things as “Zen.” Eastern religions do not appeal to me. The very idea of a meditation practice revolts me. The word “mindfulness” makes me want to vomit. I don’t presume to know anything more about Zen than what could be found in a Google search. What could he possibly mean? Could it be that meditation, in the sense of sitting in one position, doesn’t appeal to me because I’m always in a meditative state, always aware of my thoughts, always in my own mind? I do things In a slow, unhurried, unstructured way, in my own time, in my own way. I sit with a box, a melange of newspaper clippings, old letters, saved church programs, death certificates, receipts, recipes, etc. I carefully examine each item, one at a time. Some things are clearly garbage. I do not need to keep old Ann Landers columns. And then I come across, in what must be Great Grandmother Jones’ handwriting, a list of her then-living children with their birthdays and ages, written in 1937 when my mother was just a year old. I had just been asking my sister if she remembered all of their names. Most of them died before I was born. But I remember (Grand) Uncle Mark, who lived in a little cramped and cluttered room in Grandmother’s farmhouse. He was always tinkering with things, always had dirty fingernails, would walk on the farm with me when I was very little, showing me the pretty but poisonous berries. He was patient and gentle. I still have the doll he gave me as a baby. He was petite, thin, and wiry. And then I think how he was similar in some ways to a boyfriend I had not too long ago and my ex-husband. Why are we attracted to certain people? Could it be, unconsciously, they reminded me of Uncle Mark? He died when I was still young, maybe four or five. Left: Choctaw doll from my childhood. Right: Madame Alexander 1968 Huggums from Granduncle Mark. And so it goes… the memories, the stories, the reflections… to be continued through time. No doubt many things get lost, discarded, forgotten. Inevitably there are missing pieces to the puzzle, details lost forever, allowing for myth-making of uncertain accuracy, uncertain ancestry. And maybe what matters is not so much truth but function, how we use the stories we piece together to understand ourselves and our own lives. “E.B. was a quiet man. There was no bombast — no aggressive self-assertion. There was about him a native shyness that added to the attractiveness of his personality. He was always ready to render service to others and did so in many ways. He was ever humble in spirit. He was a true and trusted friend, and today I am conscious of a deep sense of personal loss. E.B. knew life in all its forms — joy and sorrow — success and failure — pleasure and pain — gain and loss. Through it all his Christian faith remained unshaken. It was a simple faith — but deep and strong. I’m glad I saw this.